A bear was reportedly sighted Monday evening near the Marshall Mini Mart. He said, “Apparently, somebody chased (the bear) away from their yard.” From there, he said the bear went from behind the store into another nearby yard. The bear then pushed through a gate, went to the “top of a hill, looked around for a second, then disappeared,” Kenner said. He added that he thought the bear was probably a juvenile. Kenner said the bear seemed to weigh about 150 pounds, and was probably about five feet, 10 inches tall. And then, just as quickly as the bear had come, it was gone. Kenner said he has been asked why he did not take a picture. “It was on the move,” he said, adding that the encounter only lasted a few seconds. 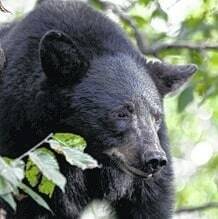 Short added that late Tuesday morning she had heard that the bear was spotted on SR 124, near the Highland County Dog Pound. Dog warden Cathy Siefer said Tuesday that she had not heard anything about a bear in the area. Similarly, deputy dog warden Gwendolynn Guthrie said they had not received any calls concerning a bear. “Nobody’s reported it,” she added. According to the Ohio Department of Natural Resources (ODNR), Ohio is home to a “small but growing population of black bears,” as stated on the department’s website. The ODNR adds that black bears are “usually fearful of people.” The website recommends remaining calm during a black bear encounter. The ODNR further suggests not running away; warning the bear that you are nearby by talking in a firm, calm voice; and making sure there is space between you and the bear. The department adds thatif the bear approaches you should raise your hands above your head to appear larger and then clap or shout to scare the bear away. Finally, according to the ODNR, you should exit the area as slowly as possible.